There are a lot of twists and turns on the path to righteousness, or enlightenment, or getting the band back together. Which path were you on, again? Nevermind. We're not very good at giving directions, anyway. We tend to get turned around, and all the signs start to look the same. 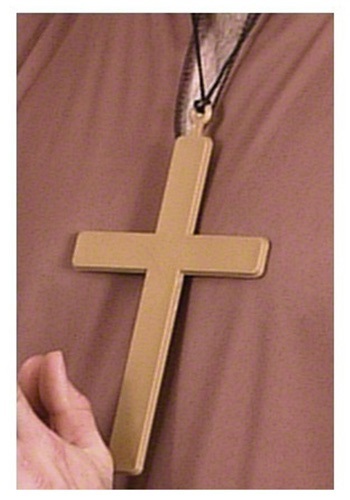 Whatever your destination (and sense of direction), we believe that this PVC Monk Cross could come in handy. Wear it if you want to make a statement about your faith, or if you think you'll have to sketch out some rapid-fire 90-degree angles in the near future. If you're like us, you might also need a helpful reminder about who has the right-of-way at crossroads. Listen: you might be a cardinal, or you might just be a lay person, but you still have to obey basic traffic laws. This is a lesson that many pilgrims have learned the hard way. Hey, maybe we aren't as bad at directions as we thought!